Many tourists in Vienna make it to the Mariahilferstraße, Vienna′s primary shopping lane with a Barouqe church. Hardly anyone on vacation in Vienna gets to Landstraße, the Mariahilferstraße-equivalent of the south. The area between the Stadtpark and Rochusgasse is full with shops of major chains - but generally of lower regard than those of Mariahilferstraße. Another thing both streets share is a major Baroque Church: In the case of Landstraße, it is the Rochuskirche Church, overshadowing the fresh food market of Rochusmarkt. A church on this site was originally built by Augustinian monks, Augustinian Eremites, to be precise - sort of "die hard Augustinians" that had their problems with the existing Augustinian Choristers from the monastery at the Hofburg. There are even chronicles about beatings between the two fractions, started by the Choristers who disliked being rivalled in the discipline of piety. 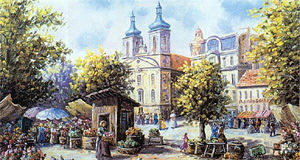 Emperor Ferdinand III had called the Eremites from Prague and in 1642, he built them their own monastery at Landstraße - outside the city walls. Unfortunately, when the Turks advanced on Vienna in 1683, pretty much every building in the surroundings of the city that was not protected by the city walls was thoroughly flattened. Including the fancy new Augustinian Eremite monastery. In 1687, the Turks had been defeated and Austria reached its Baroque bloom, a new church was built with an enormous twin tower and St. Augustine sitting in between, flanked by two Augustinian monks. The interiors match well with the outside. Note the central altar from 1690, donated by Emperor Leopold I. It sits close to the area where the common audience is during mass to represent Christ being central and getting close to the people who follow him. The altar painting is the original one from 1690, was made by Peter Strudel (a famous Austrian painter of the Baroque age) and depicts - as common with central altar paintings - the patron saint St. Rochus. He is joint by St. Rosalia and St. Sebastian - the three together are the protectors from Plague. The central woman is the Virgin Mary and the Holy Trinity, also key figures in fighting plague (see my article on the Trinity Column on Graben). The central altar is supplemented with several smaller side-altars, which (I think all) date back to the same period. Since a refurbishment in 2008, the Rochuskirche looks all nice and shiny from outside. If you are there, do have a look at the Rochusmarkt - it is tiny compared to the Naschmarkt and sells the typical "market mix" of fresh fruit and vegetables, snacks, spices and coffee - but it is a nice spot nonetheless. People who work in this area like to go there for lunch. Attractions nearby are the Palais Wittgenstein and the Hundertwasserhaus. There are also Flak-Towers (air defence towers erected by the Nazis) in Arenbergpark just off the Rochusgasse. One of them is used by the Museum of Applied Arts, which is also in walking distance.